Well, well.. Who is going to pay for the illegals squatting in Cali? Obama? ROFL. Well, you just deserve what you’ve got coming CA. You are a horrible state, now. You used to be beautiful and prosperous. Now, you are an entitlement society of leeches and scum. It’s sad. While living in Cali, I used to bring grievances to City hall, Townhall, the Newspapers, you name it. They didn’t listen, now they will pay the price… AND, they have 2 of the biggest moonbat females for senators; Boxer and Feinstein. That’s what you get with women in charge and ‘Jewish’ women to boot. What a mess. Al Jolson would be puking because of you creeps. Nobody ever really wins at Thumb Wars, which makes the whole thing rather pointless; and, as it turns out, the same can be said about the subject of Grant Williams discussion in this week’s ‘Things That Make You Go Hmmm…‘, – Currency Wars – which seem to be erupting across the globe; and, as they gain in intensity, these monetary conflicts are threatening to throw a major spanner in the works of a world that, until recently, seemed to have been operating under the assumption that it was possible for multiple countries to all devalue their currencies simultaneously in order to inflate their massive debts away. 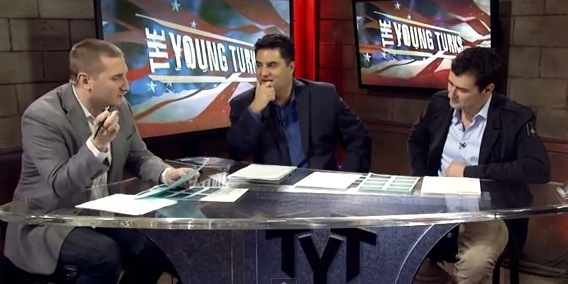 Why do ‘The Young Turks’ hate White Southerners? It’s a fascinating sit-down with a very wise man. Around the 13:30 mark, there’s a very good summation of why the anointed intellectuals believe what they do so firmly, and reject the contrary. There’s a huge ego component to it. If you believe in free markets and traditional values and so forth, there’s no exultation that comes with it. You’re just someone who believes in free markets and traditional values. … But if you believe in social justice and saving the environment, you are really something. People with that viewpoint have a huge ego stake. Empirical evidence is like gambling all of that on a roll of a dice.